It left me deeply uncomfortable that Uncle Ruslan Tsarni would seek to decimate his nephews when it could have no discernible effect other than to benefit him -- and, further, that he would use the language of children in a lousy attempt to explain a very adult tragedy. If Dzhokar and Tamerlan Tsarnaev can accurately be classified as "losers," as their uncle, Ruslan Tsarni, theorized during a press conference Friday from Montgomery Village, Maryland, it seems clear which side of the family the brothers inherited that particular gene from. 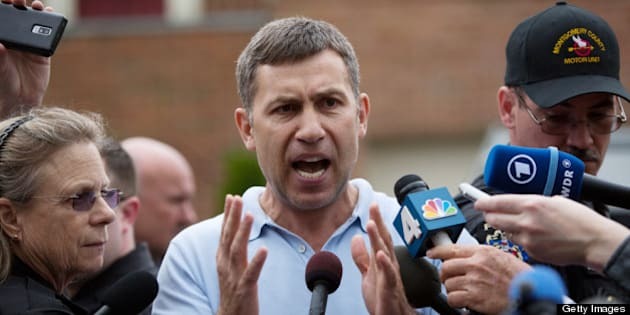 For amid all the craziness in and out of Boston that day -- including a city-wide lockdown that, in effect, achieved what these terrorists sought, and what all terrorists always seek -- uncle Ruslan's impassioned declaration of the loser-ness of his nephews seemed to me the craziest. Regardless of the relationship between the Tsarnis and Tsarnaevs -- and Ruslan made it very clear the two families are not on speaking terms, and haven't been for some time -- the way he sold out his nephews was just pathetic. There were some alternative responses available to Mr. Tsarni when he stepped in front of media encamped outside his house. He might have questioned the allegations against the two boys, like their Toronto aunt, Maret Tsarnaeva, did. Even if her words hinted at the same sort of probably-ridiculous conspiracy theories that would be put forward by the boys' parents later in the day (and by "false flag" nuts within minutes of the bombings last Monday), she was clearly shocked by the events. Ms. Tsarnaeva appeared unhinged and angry, and she delivered a perfectly natural response -- when faced with a massive contradiction between what she believed these boys to be and what others now said they were, she defaulted to personal experience and observation. The boys were innocent in her eyes, even when all signs pointed to their guilt. Mr. Tsarni could also have taken a lesson from the responses of Dzhokar's school friends, a number of whom came forward to be interviewed on television Friday and uniformly expressed astonishment their buddy could have been a terrorist. Like Dzhokar's aunt, when they compared their personal experiences to the massive police presence slowly closing in on a 19-year-old who closed the entire city of Boston, they could only find incongruity. Perhaps because the bonds of friendship at that age are almost always weaker than family ties, the boys seemed particularly adept at taking in the news about Dzhokar without emotion -- they managed better than the boy's aunt and uncle to remain detached from the discrepancies in Dzhokar's story, recognizing there were two sides to the story that could not, at least at that moment, be reconciled. There's probably a lesson in that. Of course, the uncle could have just kept quiet. Maybe that would have been too much to ask for on a day when seemingly everyone had something to say about the Tsarnaevs. Still, it would have been the most decent thing to do. Predictably, because he a) appears to be older than, say, 45, and b) is not a native English speaker, Tsarni used the "L" word incorrectly. The word is employed almost exclusively in our time by young and young-ish people as a form of generally benign insult. "Loser," obviously, comes from "lose" and in early times referred to a person (or an animal, like a racing horse) who lost in one form of official competition or another, but it's modern, slang-ish definition -- in effect, one who is simply a failure in one or more of even the most minute aspects of life -- doesn't really apply to the Tsarnevs, certainly not Dzhokar. He was well-liked by his peers, athletically gifted and working toward a career as a doctor. He was definitely not a loser -- a terrorist, yes, probably, but not a loser. When it comes to terrorism perpetrated in the name of (radical) Islam -- as it is rapidly becoming more apparent this terrorism was -- we're used to seeing and hearing parents, family and friends celebrating the terrorists with after-the-fact homilies (mothers wishing they had conceived more children so that they, too, could be suicide bombers is a common trope) and dancing in the streets. I suppose in that sense uncle Ruslan's dissociating reaction was something of a step forward. And yet it left me deeply uncomfortable that he would seek to decimate his nephews when it could have no discernible effect other than to benefit him -- and, further, that he would use the language of children in a lousy attempt to explain a very adult tragedy.